Modern outdoor table that challenges the traditional table design, featuring bold forms and pure shapes that will assuredly deliver a refreshing look to any space. 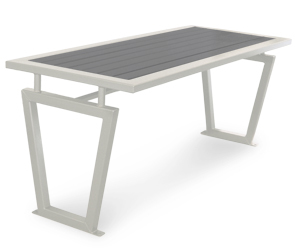 Constructed from all commercial grade quality materials, the	recycled plastic slat table top is sturdily supported by a steel frame with a durable powder-coated finish. Matching bench seats are sold separately, both 'backless' and 'with back' models are available. A combination of earth-friendly recycled plastic slats and leading-edge design, this table is a perfect way of going green, modern style.